The Svens will once again perform at Bombs Away Cafe Saturday, April 10. It will be an extra special night of music - a double header! Starting around 8:30pm we'll perform "Hulda's Story" - the narrative is a real letter from a grandfather to his granddaughter, Hulda, reporting on his adventures exploring Alaska. Various surf tunes are crafted into the mix along with some tasty sound bytes by Viking. 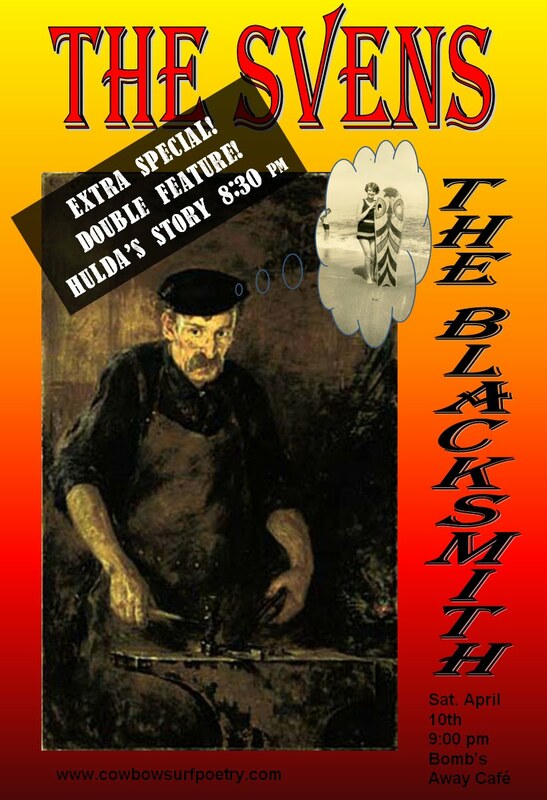 Then around 9:00pm or so we'll perform an all new rendition of "The Blacksmith" - new tunes, sound bytes and a fresh take on this classic show. And the evening will be extra, extra special because we'll be celebrating a great new CD recording release of the previous show "Doc" - I think it's the best recording yet of The Svens. The band is tight and the Sax parts are beginning to sound like a real Sax player is playing them! (Ha!) I know Viking worked very hard on the mixes, fixing our glitches and making it come to life - some of the best Sven studio takes yet. So bring your CD money too and take some Svens music home for the whole family to enjoy!